Attempts to reconstruct the compositional history of the book of Isaiah confine themselves mainly to chapters 1-12 and 28-39, supposed to shroud the basic core of any early collection of Isaianic texts. Other investigations which verge on the group of prophecies concerning the nations in Isa 13-23 rarely delve into exegetical details to the extent that the reader of Isaiah would feel convinced to stand here on familiar grounds. Even others, overtly restricted to a small pericope inside Isa 13-23, often neglect the significance of this larger context. 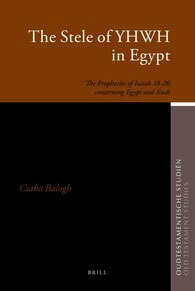 This book provides a thorough analysis of Isaiah 18-20, concerned with Egypt and Kush, from the earliest stages to their final contextualisation within the developing corpus of the Isaianic prophecies regarding the nations.